Cast: Francis Ng, Chilam Cheung, Myolie Wu, Fala Chen, Ron Ng, Kenneth Ma, Elena Kong, Him Law, Nancy Wu, Rebecca Zhu, Eliza Sam, and Kelly Fu. When Jayne emailed me and said ep 14 recap posted, I was like “Oh I finished it already? Yeah! !” and then I remembered, that was ep 14, I meant to say ep 15!! So I kinda like panicked because hey I am 2 days behind and ran to find my notes. I wrote 5 pages of notes, with dialogues and all since I feel this is one worthy of recapping the dialogues and over the weekend I misplaced those notes. I feel heart sick because I wrote the dialogues down, line by line! Especially the whole Jayden-Summer scene, much like I did for Sam-Summer scene!!! Arghhhh!!!!!!!!! WHY?! WHY?!?!?! WHY DID THIS HAPPEN TO ME?!!?! WHY?!?!????????????????????????? So here I am, kinda like flying blind. I am sure there will be many face palms here and also many misplaced scene. Only 2 days and my mind is fuzzy but I will concentrate on the important ones. This will be a short recap. And none more important than Jayden-Summer’s story. And this episode has that. But before that, the episode starts with PPP. Or maybe not. Memory is fuzzy. Our heroine, Holiday and her favourite study group together and after some discussion with her group who also muses perhaps Jayden should give clearer tips, she finally understands what he means as they are going through the various tests which also involves weather, engine, etc. So she thinks perhaps what the test requires is a cooperation with both groups. She or Hero or someone in the end convinces both groups and they come up with a report. At the class, it is revealed Jayden deliberately destroyed the data and gave Holiday the tip so as to shake things up, to give them a bit of pressure and confusion. See! I told you Jayden ain’t that terrible! Anyway in the end everybody realises cooperation is the only way to succeed or some great golden conclusion like that and Holiday does wonder about her missing notes and Sam holds up her notes and she realises Sam is into the whole charade as well! Jayden explains he approached Sam as he thought the whole test was rather boring and to shake things up and Sam agreed to assist Jayden. Holiday sort of teases Sam for being sly or something but yeah, everyone is happy that they can fly and all. A bit of momentum killer next. Coco (why is she there?! ), Heather and Roy, having lunch at a super nice open air place. Heather wants to surprise Tony, remember? Coco goes to get the wine whilst she is off to do something when she sees far away, Tony hand in hand with a gwaipo whom I assume is Jessica. Definitely not just friends, by the look of the intimate behaviour. Heather stares, and Tony looks back and sees Heather and looks distressed as Heather, face a bit surprised and then rushes away with Roy following and Tony apologises to his lady friend and rushes for Heather and poor Coco left alone to pay for the very expensive meal. and Tony hears her as he is there and Roy tries to persuade her that is what she saw was not what she think but Tony and Heather have a heart to heart talk and in the end agrees that their marriage is over because there’s no loving feeling anymore and they part as friends. Anyway, next is heart breaking. Remember Jayden says he will go with Summer to the museum? There’s Summer, waiting with Isaac. She pretends she isn’t eager but in actual fact she is very eager, as she herself says she is half an hour early and Isaac suggests buying coffee and drink and wait which she is ok with. Jayden is running very late. He is with a gwaipo and the gwaipo got him the museum’s ticket and I think he agrees to fly her around. Frankly I can’t remember much except to say by the time Jayden is running to the museum, he is past his half hour mark. Summer is very very upset, and after just half hour, Summer in her mind hears the voices of her past, where her voice is a little girl begging her big brother not to leave her and Jayden, with a young man’s voice promises “I will be back for holidays, you’ll see” and I suppose he never did and suddenly she stands up and angrily says “I won’t wait any more! !” and Isaac as usual tries to calm her down but Summer is also very disappointed as she feels Jayden has yet again disappointed her and abandoned her. This girl has abandonment issue, I won’t blame her. Same time we see Jayden running into the museum huffing and puffing and a gwailo walks out and says “The museum is closed sir” and Jayden asks “Did you see a young lady waiting here? She might still be here!” but the gwailo basically confirms basically everyone has left. And Jayden knows he screwed up, big time. I was very disappointed with this scene. It never explained WHY Jayden was late. At least show some traffic congestion or something. Or better yet, when will be the best time to play a haunting Adele song? NOW! That’s the time. Why not show Summer silently waiting, expression getting more and more disappointed as Isaac looks at her with concern and inter cut with Jayden involved in some major traffic congestion, getting panicky, getting out of the taxi and run for his life as again inter cut here, inter cut there, with a scene of Jayden running and intercut with the memory that Summer had (you know, those voices as a child and all that) and finally Summer says enough is enough and back to the scene as TVB showed us. I mean why not just go for the emotional punch? Why waste such a great opportunity? Instead of wasting it on Holly who can’t even fake-stumble right as she ran up the hill and cry a tearless cry, why not show it for Jayden and Summer to give us that emotional punch where we know Jayden wanted to be there but couldn’t and that we will cry that Summer and Jayden won’t be reconciled just yet? Because I do care if Jayden and Summer reconcile but I couldn’t care less if Daniel rises from the dead and haunts Holly and unleash the meteor shower on her as she fake-stumble-run-fake cry her way to the end of the scene. Jayden alone in the hangar sitting by the 2 seater plane and Holly walks in and sees him looking miserable and asks what’s bothering him and Jayden says solemnly “I always thought promises aren’t that important. Now I know it may not mean much to me, but others, it might mean the whole world” and Holly saying something about promises are important or that sort and Holly says “Why not I record this? You make that solemn promise, so that you will be bound by it” and she takes out her phone and records Jayden who plays along with her and solemnly swears “I swear, I will never make another promise I can’t keep, from now on, I will make promises I will follow through”. And he did some jiggy with his body (I swear he did!) and he had a good laugh with Holiday. And I think this is where the episode ends. Or maybe not. When I finished this I suddenly remember the freaky singular love story between that cafe girl whose name I forgot and Isaac. I think I forgot this because I saw Apple and I mind went blank. Anyway Isaac got a very direct confession of love when he was given a cup of coffee and on the coffee cut paper-holder something, she wrote her feelings like she fell for him by the time she made him his 2nd cup. She met him face to face and confessed that she was always nothing him, looking at him, made his favourite coffee, etc. I can say, she has taste! Anyway in the end she approached Apple who eagerly asked what happened and in the end she showed Apple that paper thing she wrote on and Apple felt sorry for her but cafe girl cheerfully asked Apple to keep it at Lost And Found hoping maybe one day Isaac or herself will retrieve it from that Lost And Found dept. Another momentum killer only because we ALL know Isaac will fall for Summer. But since it is a long way to go, along the way maybe he will you know really like this cafe girl’s heart and then break it. As for Heather-Tony, I really couldn’t care less (or more or whatever percentage). Performance wise, not much comment for everyone except Myolie. Myolie’s role as Summer is too restrictive for her. And the more restrictive, the more I am NOT convinced. At least she had real tears and it is sort of a desperate sort of crying scene but somehow like all her other crying scenes in other series minus what everyone loves to call the “gwing” factor? I just feel her expression is just “I cry because I am told to”. I feel not much emotional connection. I in fact felt Summer is too harsh on Jayden. Only half an hour and she can’t wait. She waited for more than a decade for her brother to come home, why sell yourself so high? Now that will be easily fixed if we are shown the way I was imagining it should be shown. That way I as a viewer will feel pain for Jayden who is trying very hurt to win back the love of the only girl who matters in his life whilst I will feel for Summer and her anger and ultimately the utter disappointment for having to wait another 30 minutes only to know that the guy who matters in her life does not show up and so makes her feel as if she does not matter. You get what I mean? That I will feel for more Myolie’s crying. I feel even in her angriest scene she is so.very.uptight! When will Summer breakdown? When? This Episodic Thoughts was written by Funn Lim, a Contributing Writer at JayneStars.com, and was originally posted at http://p2e-tits2.blogspot.com/. Bet you will like episode 16. Three times in this episode Sam was reminiscing about Zoe, three times I cried. Heartbreaking performance by Francis. I’m watching it now and can someone please make Holiday disappear! I really can’t stand her. I don’t understand why Jayden has time for Holiday, but no time for his sister, Summer! And just so quickly she can sleeps with Jayden. It is so unconvincing! I’m glad TVB is generous with the Sam-Zoe moments. In the beginning, I feared they would cut it all off in order to promote the Sam-Holly story. It’s so RIGHT that Francis loves the Sam-Zoe moments the most and his acting shines the brightest during these performances. Does anyone have a link to that scene? I’m desperate to watch it. Funn, What do u mean ‘I just feel her expression is just “I cry because I am told to”. I personally thought that Myolie’s crying scene was pretty good and I felt that emotional connection which you (unfortunately) did not feel. But yes, they should’ve kept the audience in suspense on whether or not Jayden would make it to the museum. My apologies. Found my notes and the ending scene missed out the entire confrontation between Holly and Sam about Zoe! I will add that in in my recap in ep 16. I think Isaac did say Jayden messaged him that he will be late. Again it will of course be more clearer if we are told perhaps his phone ran out of battery or better yet, as he ran in slow mo he fell and phone thrown into the mouth of a gigantic dragon as Jayden screams NOOOOOOOOOOOOOO, all these done to Adele’s 1000th song. Better wait. All at one go you will feel like lethargic. i didnt catch any signs that Holiday was falling for jayden in this episode. Did she?? Disppointed by your thoughts for this ep. Yeah I know, you have forgotten then the episodic thoughts is very short but actually I have waited for more about the end and the Myolis’s crying scene. I also know that you find her acting not appropriate, but you don’t say a word about it. There are 2 endings to this series… So holly may not end up with Sam in the end. Zoe is dead lar. Like this Sam must die. That is so k-drama! Either Holly with Sam or Holly with no one. Why not? Because Francis is first lead. Actually, the media reported it wrong (and most of the outlets have since corrected themselves). Ron didn’t say that TITS2 will have 2 endings…..he said that TVB has done 2 different endings to series in the past based on audiences’ likes and dislikes, so perhaps they were just heeding audiences’ wishes by cutting out that Chilam/Fala love scene…..certain media outlets took his words out of context and spun it…. At this point, my preferred ending is it was all a dream and Zoe is alive and well and there is a Jayden who is married to Holly and there is a Summer who is not related to Zoe. Or Holly dying and Sam marries Belle who returns and Jayden marries Anita Yuen who guest stars. Don’t rely on my ep 15! A lot of things missing but ep 16 is back on track. I have yet to watch ep 17. need to get away a bit. Actually still not yet. Very snail pace except there is some update on Jayden-Holly but the ones that matter, Sam, Summer, etc still the same. So the momentum is slowing down. This series should end at 30 or 35 episodes. I remember a reader here said Holiday is about 30 or 29. Sam should be 45? Anyone who has access to TVB infopage in Chinese please do reply. 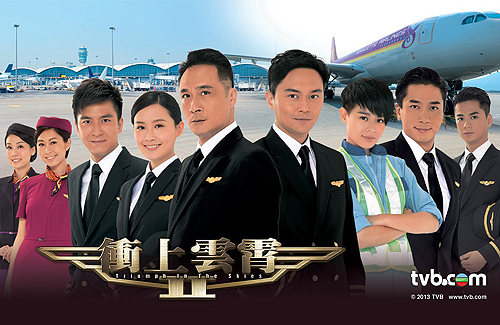 According to http://programme.tvb.com/drama/triumphintheskies2/cast/, Sam is 45 years old, Jayden is 38 years old, and both Holiday and Summer are 29 years old.